Oliver Snatcher’s family are weird. They sneak around at night dressed in black stealing things, including secret files. They’re professional cat burglars and they’re very, very good at it. The Government recruits them to work for its undercover spy agency PHANTOM. Only their six foot tall robot, Roger, knows the dangers of working for PHANTOM. He’s not just a friendly family robot bought at a science fair. When creepy Professor Withers gets his hands on Roger he implants an emotion chip — the very thing Roger does not want. Roger becomes unpredictable and dangerous. Has Oliver’s wise and amazing friend become a killer robot out of control? Who will protect the Snatcher family now? 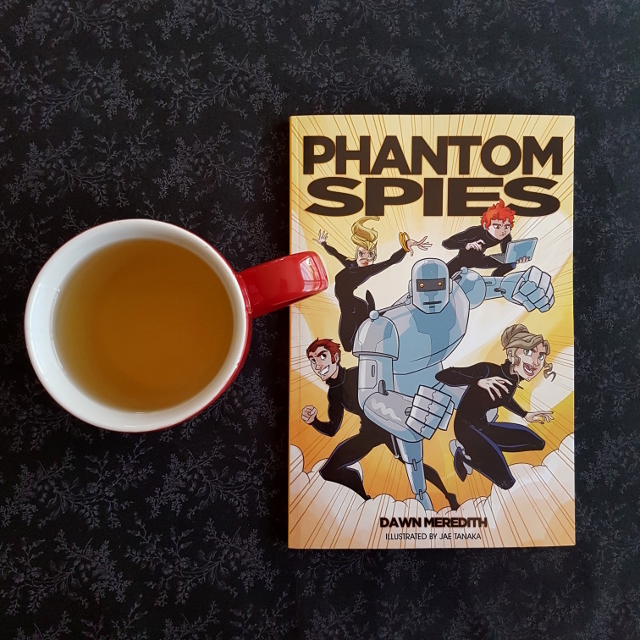 Phantom Spies is a fun middle-grade novel with a cartoon-like style that put me a bit in mind of The Incredibles. However, there were a few flaws that let the book down. Oliver was a great main character. He struggles to balance his family’s late-night heists with his school work, barely scraping by on his spelling tests. He also has to keep his family escapades a secret from his friends. And then there’s his anxiety about the inevitable capture of his family. This anxiety made Oliver particularly relatable. He is the only member of his family who displays any common sense. His family’s love of thrills and treasure means it’s up to him to be the responsible one. He does his best, but he’s still young. Fortunately, he has a friend in Roger the robot. Roger is a steady influence, always calm and ready to listen to Oliver’s worries. For a robot who is supposed to be emotionless, he comes across as quite warm and compassionate. His name and his smooth, James Bond voice is a delightful nod to Roger Moore. The story is reasonably well-paced, starting off with the Snatcher family in the middle of a heist. The short chapters keep the story brisk, though there’s a section detailing Oliver’s stay in foster care that, although charming, doesn’t add significantly to the plot. Indeed, a weak theme let down the book. The first half focuses on the Snatcher family’s lack of responsibility, while the second focuses on the danger Roger presents as his emotion chip makes him dangerous and unpredictable. These two themes never quite seem to come together. Roger’s issues with emotion aren’t really a broader issue in the book, but remain focused on the robot. While this may allow it to sidestep the perpetuating of toxic masculinity, it also doesn’t allow for a coherent merging of themes. Overall, Phantom Spies was a lot of fun, but didn’t quite hang together.